The UK Vision Strategy has published the ‘Shaping the Future Report’, to inform future collaborative work in the eye health and sight loss sectors. Views on the progress made towards the UK Vision Strategy Outcomes 2013-2018. The country context: the key challenges and successes of the Strategy specific to England, Scotland, Northern Ireland and Wales. Recommendations to shape future collaborative work, including both what future work could focus on and how it could be delivered. Over 750 individuals participated in the research through a mixed-methods approach including interviews, surveys, and engagement events in all four countries of the UK. The report recommendations were co-produced at a workshop involving people who are blind or partially sighted and individuals representing a range of professions in the eye health and sight loss sectors. “I am delighted by the engagement we received from organisations and individuals throughout the Shaping the Future Project. 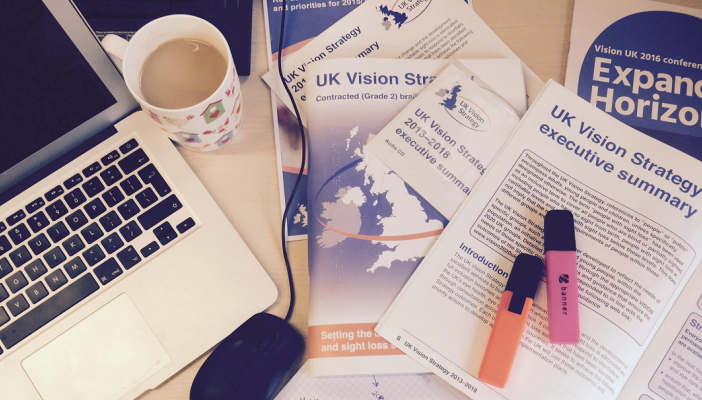 Leaders across the eye health and sight loss sectors are strongly committed to ensuring that the UK Vision Strategy is fit for the future, and this report provides a foundation for us to build on the ambition, experience and lessons learnt from the Strategy since its launch”. The learning and recommendations in the report will be taken forward by the Vision Strategy Transition Programme, which is working to seek a renewed agenda for change across the eye health and sight loss sectors. Find out more about the Shaping the Future Project and the Vision Strategy Transition Programme on the UK Vision Strategy website.